Fiona joined the firm in 2000. She is a law graduate of the University of Ulster and of the Institute of Professional Legal Studies at Queen's University, Belfast, where she qualified as a solicitor. 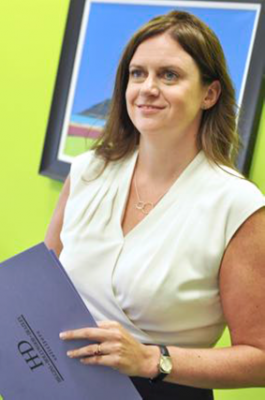 Fiona became a Partner at HHD on 1 July 2015, having been promoted to the position of Associate Solicitor in 2012. She specialises in cases of medical accident/medical negligence, and she is a member of the UK group, Action against Medical Accidents - www.avma.org.uk. Fiona has extensive experience of a wide variety of medical negligence cases, including catastrophic birthing cases, cosmetic surgery cases, dental negligence matters and misdiagnosis cases. In 2008 she was successful in a highly complex birthing case which had resulted in severe brain injury and catastrophic injury to a child, at the High Court in Belfast, which awarded a family in excess of one million pounds in compensation. Fiona was also recently successful in obtaining compensation for her client who had underwent defective hip replacement surgery which required removal and replacement surgery. She worked with Damian Deazley on the recent case of KD (minor) in 2014, which was the largest ever settlement in Northern Ireland of a medical negligence case, involving a child with cerebral palsy. Her other recent successful cases include those of failure to diagnose cervical cancer, delay in diagnosis of rotator cuff tear injury, negligent cosmetic surgery procedures, negligent surgery resulting in a drop foot and a MRSA case resulting in paralysis. Other cases where Fiona has been successful in obtaining compensation for her clients include negligent treatment of a lisfranc injury and negligent teeth whitening procedure. Fiona is working with Lauren Jones and Damian Deazley in the medical negligence team assisting women in vaginal mesh litigation and also patients previously treated by Dr Michael Watt in Northern Ireland. Her everyday caseload also includes general litigation such as road traffic accidents, trips, slips, falls and accidents at work. She has a detailed knowledge of Legal Aid and is efficient in completion of the relevant documentation. Fiona regularly applies to funders for After the Event Insurance and also to home insurance providers. Fiona currently serves on the Law Society Contentious Business Committee and Taxation Liaison Committee on behalf of the Law Society. She has served on the committee of the Belfast Solicitors’ Association - www.belfast-solicitors-association.org and is a member of the Law Society of Northern Ireland - www.lawsoc-ni.org. Fiona also guest lectured, along with Gabriel Greene of Goldblatt McGuigan Accountants, at the Ulster University Medical Law and Ethics course in 2018. At HHD we sponsor the medical law and ethics prize at the Ulster University School of Law each year and Fiona is delighted to welcome each winning student during their internship.